The true innovation of the P-TECH Model is its comprehensive focus on careers. Industry representatives are integral partners in the development of P-TECH schools. Their involvement helps students understand how their coursework, field experiences, and the “real world” expectations of the workplace are connected. These connections serve as a motivator and support mechanism that lead to greater student success. As one of the early steps in developing a P-TECH school, Industry Partners lead a skills mapping process that identifies the skills required for entry-level jobs. Once identified, these skills are mapped to create a six-year workplace learning curriculum for students. To ensure students graduate career-ready, Industry Partners also provide a comprehensive set of focused workplace experiences. These experiences are not ancillary to the high school and college coursework, but are instead integrated into the academic Scope & Sequence over the six years of the model. These opportunities provide students with direct exposure to professionals in their chosen field and teach them the skills that employers seek, such as communication, teamwork, and problem-solving and help answer the questions that many traditional academic programs fail to answer for many students: Why am I learning this, and how does it prepare me for my future? The focus on two conceptual elements — “exposure” and “application” — is integral to the P-TECH Model. Each year should incorporate both elements, with an initial focus on knowledge and an increasing emphasis on application as students mature. Students in a P-TECH school need to “learn by doing” as much as possible. This occurs through the Workplace Learning curriculum, as well as in project-based learning opportunities in all core academic classes. Project-based learning focuses on real-world issues and teaches students how to collaborate and solve problems. Students learn how to build consensus and compromise as they elicit ideas and feedback. Developing these skills is vital to success in the workplace. Student voice and choice are prominent within this instructional approach, where the teacher has a role more akin to facilitator. Teachers and students learn together, which helps students feel comfortable with adults as peers. This democratized approach to learning helps students prepare for professional environments, where there might be little age difference between employer and supervisor, or where all employees are called by their first names, regardless of age or experience. Industry Partners play a key role in the school’s project-based learning approach. They should work closely with high school and college faculty to connect academic content to real-world situations and to ensure that workplace readiness skills are also addressed. Career foundation courses are an example of project-based learning. These courses provide students with the knowledge and skills related to the school’s industry focus. They build on one another over the six-year model and involve a variety of enriching and engaging experiences. Teachers, working with college instructors and industry professionals, design real-world situations to build academic knowledge and develop problem-solving, teamwork, and communication skills. Students have opportunities to interact with professionals as they also venture into businesses, college campuses, and the community as part of their learning. At a school focused on careers in nursing and community health, for example, students in Year 1 will study the patterns and prevalence of disease in their school’s neighborhood. Acting as epidemiologists, the students construct community surveys to understand the issues around diseases. As they learn more about the diseases and the people afflicted, the students build their knowledge of medical terminology, types of treatment options, and gaps in services that may exist. This learning happens through a well-constructed classroom curriculum. It also occurs through site visits to neighborhood medical centers, which provides students the opportunity to observe treatment of the diseases and efforts in public health outreach. Finally, students also engage with practitioners in the field and learn more about the career path of these professionals and how they deliver health services. By Year 2, students will have sufficient background to propose new public outreach and awareness plans, as well as coordinated prevention plans. These proposed plans will be assessed by a panel composed of high school and college faculty and industry professionals. Students working with public health professionals and community leaders will implement the most promising plan. Together, they will monitor this intervention, and construct pre- and post-assessments, as well as interim measures to test the success of the plan. Students in Year 3 might have the opportunity to be certified phlebotomists as part of their college coursework and spend part of their school day at a medical center assisting nurses in drawing blood and checking vital signs. In Year 4, Year 5, and Year 6, students will be engaged in practicum at increasing levels of challenge that give them valuable applied experience in their field. Nursing and community health students will be placed in health practicum experiences at the hospital, for example. Students will be supported and evaluated by the combination of the nursing program staff at their college, and by the supervising staff at their practicum placements. The final three years of the program are focused almost exclusively on the combination of work and coursework leading to the degree and certification in the field. From the moment Principal Mike Dardaris began planning to open HFM P-TECH school, he knew that project-based learning would be the cornerstone of the school. A Workplace Tour is a highly structured career awareness activity in which students visit a workplace, learn about the business, meet employees, ask questions, and observe work in progress. Proper planning and preparation, attention to legal and safety details, maximization of learning potential, and communication and support for the student and industry host will help ensure success. All Workplace Tours should include a structured activity before, during and after the experience. These activities help ensure that students and workplace hosts have meaningful, productive experiences that result in enriched student learning. Learning about the skills students need for well-paying jobs is informative. But enabling students to practice and demonstrate those skills can be transformative. P-TECH students are matched with professionals in their field of study who act as mentors, modeling behaviors and skills and offering support, guidance, and inspiration. Mentors should be carefully selected from the Industry Partner, as well as from other businesses in the field, for their ability to lead and work well with students. Regardless of their backgrounds, all mentors should be trained, so they understand their roles and responsibilities and the best way to engage students. Students may be matched to the same mentors for the entire course of their P-TECH schooling, or have different mentors throughout their experience. Depending on the focus of the mentoring activities or other outside factors, such as the distance between the P-TECH school and the Industry Partner, mentoring relationships can happen through in-person opportunities or securely monitored online communication. They can involve participation in school projects, like hackathons or resume writing workshops, or simple discussions at the school or workplace. 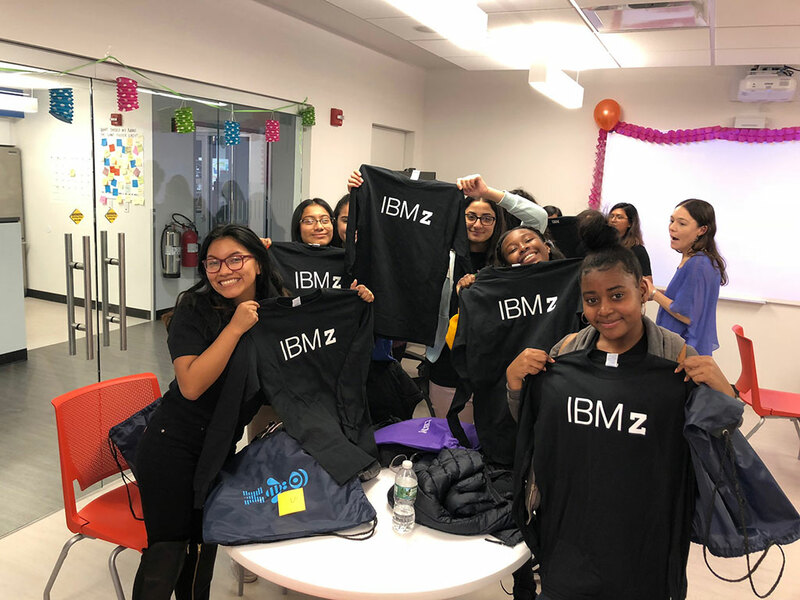 An IBM mentor and 11th grader at the Sarah E. Goode STEM Academy in Chicago, IL share their experiences as a mentoring team. Service learning gives students the opportunity to contribute to society and learn the importance of citizenship, while developing their technical and workplace skills in a real-world environment. This approach provides students an opportunity to offer their services to a community or non-profit organization that needs support. Students are not paid for their time, but rather contribute their skills to provide something of use. What is offered is determined and mutually designed by the organization in need and a team of students. For instance, students could work with a social services organization to build a website or create an app that would help that organization better serve its recipients. Student teams and professionals adopt an iterative, project plan approach that helps ensure that the project goals are realized and students learn transferable skills. 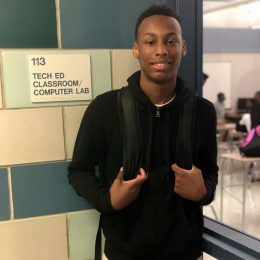 Internships represent a significant milestone for a P-TECH student, signaling that the student is ready — academically and emotionally — to leave the safe haven of the school and take on an actual job assignment in a real workplace. Internships are designed to deepen and broaden students’ skills and knowledge of the industry. The P-TECH school’s Skills Map should be used to identify the specific skills students should develop during their internships. The Skills Map also works as a reference to inform assessments of both the student and the internship at the end of the placement. Students can be placed individually or in groups and asked to produce work in a team setting, which mirrors what many actual employees do. All students are paid by the employer, ensuring that their internships resemble real world jobs, that their work is of value to the employer and that they are not deterred from meaningful work experiences because they need to find a job that makes money. A significant amount of preparation goes into internship development and placement. Students create professional profiles that present qualifications relevant to their industry. For example, students focused on IT might create online portfolios that detail not only their academic accomplishments, but also links to websites or apps they have created. Students also require preparation through workshops that cover “dressing for success,” workplace etiquette, resume writing, and “mock” interviews. While the goal is to provide all eligible students with an internship, internships can still be competitive, and students should expect to interview for positions. Similarly, employers need training and preparation to provide these skilled, but young, students with the appropriate level of support and supervision. Internships often begin the summer after Year 3, when students have completed some college coursework and acquired significant technical and workplace skills. It is up to the school and its partners to outline the criteria that determine when students are ready. Because internships launch as early as Year 3, when students are around 16 years old, school partners and employers should create internships that provide educational bridge experiences in which students are learning and contributing to the best of their ability. P-TECH schools should develop a network of industry partners to sustain the required number of student internships over time. This is critical for several reasons. Even a large Industry Partner may not be able to provide the sufficient number of high-quality, skills-based, paid internships required for all students as the school grows. In addition, it is important to provide students with a variety of industry experiences, rather than only the perspective of the lead industry partner. Not all partners have to make the same level of commitment as the lead partner, but they will be essential to the long-term success of the school. Providing students with opportunities to develop their skills in a real-world setting is key to career-readiness. It’s also a key aspect of the P-TECH Model. The success of Workplace Learning — and the school as a whole — is dependent upon the people focused on day-to-day implementation, the Workplace Learning Coordinator and the Industry Liaison. A full-time Workplace Learning Coordinator manages the Workplace Learning component and ensures that it is an equal and integrated aspect of the school, along with other academic areas. The coordinator works closely with the teaching staff to ensure that foundational workplace skills are being embedded into the core academic curricula. For example, the coordinator might work with the math teacher to integrate presentation skills that are specific to industry needs. This enables students to practice professional skills across different educational settings. Additional responsibilities include managing relationships with local businesses and working collaboratively with the Industry Liaison to implement mentoring, worksite tours and internships. The Industry Liaison is an employee of the Industry Partner and is responsible for managing the commitments that the employer has made to the school, including mentoring, workplace tours and internships. The liaison also ensures that the school’s long-term goals are integrated into these projects. The Industry Liaison has office space at the school and is integral to the school staff. Learn more about the Industry Liaison role.